Modern bathrooms are increasingly luxurious and modern. At the same time, classic bathroom fixtures are gaining in popularity. Some homeowners want to restore the original look of their home’s bathrooms. Others want to modernize their bathrooms to create spa-like experiences. Purchasing new fixtures, such as bathtubs, toilets, sinks and cabinets can be expensive. Removing bathtubs to put in new ones can cost around $3,000 alone. If you want to replace your vintage fixture, it might take you a long time and a large amount of money to locate and purchase an authentic-looking piece. Instead, you can choose to restore the beauty of your existing features by refinishing them at a substantially lower cost. Here’s what to consider when you are determining which is the right approach for you. Is your fixture able to be refinished? If your fixture still works as it is intended to work, you don’t need to throw it away. You can instead restore or refurbish it. People sometimes refer to the process of restoring the look of vintage fixtures as reglazing, but that isn’t an accurate term. Glazing is the fired process that can only take place in factories. Instead, restoring the surface or resurfacing would be more accurate terms to describe what you do when you restore vintage bathroom fixtures. You can restore cast iron, fiberglass and porcelain fixtures. If they are beyond saving, though, you’ll instead want to replace them. Restorable fixtures can be updated by homeowners or professionals. Whether you will undertake the project yourself or hire a professional to do it, the process will be the same. You’ll need to clean, sand, prime, paint and seal the fixture. 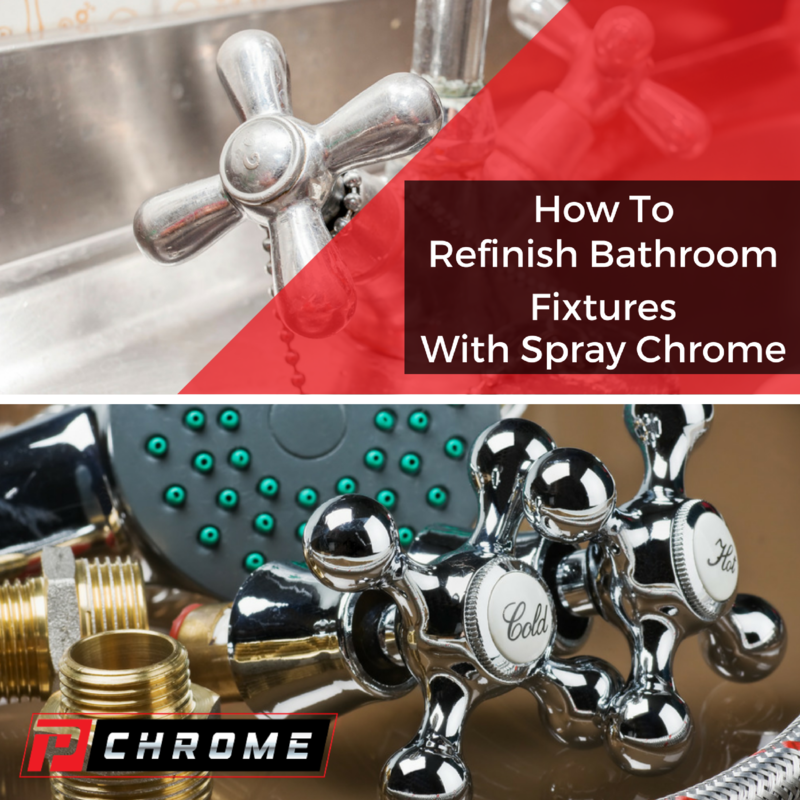 If you choose to spray chrome your fixtures, you can do it by yourself as a do-it-yourself project by using PChrome spray chrome kits. Mask off all surfaces that you will not be refinishing using your painter’s tape and plastic tarps. Clean the surfaces thoroughly in order to remove traces of oil, dirt and soap scum. Repair any scratches, chips or broken pieces using filler. If you’re refinishing your tub, apply a bonding agent all over the surface that you’ll be chroming. Sand the surface until it is smooth. Mix your solutions and basecoat. Your S, R, and D solutions are mixed by adding one part of each to every 30 milliliters of water. You mix your W solution together at a ratio of 4 parts of W concentrate to every 30 milliliters of water. Your base coat is mixed up with 2KA basecoat and 2K hardener together in a 1:1 ratio along with 20 percent of the black reducer. Apply your basecoat using back and forth passes, working from the bottom of the fixture up to the top. Allow it to cure for 24 hours, and make certain to clean your spray gun with paint thinner or acetone. Sensitize the surface. Spray on your W solution, liberally coating the surface. Follow that with your D solution and rinse it with deionized water. Reapply your W and D solutions and rinse again with the water. Apply your chrome. Immediately following the sensitization step, apply your chrome, which is made up of the S and R solutions in your dual-nozzle sprayer. Using back-and-forth spraying motions, work from the bottom to the top, continuing passes until you have the degree of shine that you desire. Blow off any remaining water droplets before moving on. Apply your topcoat. Your top coat is made up of 2KA topcoat, 2K hardener and 2K clear reducer in the same ratios used for your basecoat. Spray on your topcoat using fast back-and-forth sprays moving from the bottom to the top. It will cure within about 48 hours, and you can apply another topcoat layer after that. When you are ready to update your fixtures with PChrome, call us or order your kit online.